MacOS’ Mission Control and full-screen mode are great for swiping quickly between apps and keeping your workspace organised. But what if you want to work in a different way? What if you want multiple windows open on one screen, but in a way that’s neat and tidy and allows you to move from one to the other easily? That’s where Mosaic, available in Setapp, comes in. Mosaic allows you to tile open windows on your Mac screen so that they are all visible at the same time, but also neat and tidy. This app has a library of set layouts for tiled windows. When you drag a window on your Mac, the layout view appears as an overlay on screen and you choose the one you want, and where you want the current window to sit in that layout. You can then add more windows to the it. Layouts can be organized in groups – such as those for two apps, three apps, etc. And you can create your own if none of those in the library suit you. And, as a final neat touch, you can control Mosaic on your Mac from an accompanying iOS app. When you have multiple apps open on Mac, a great way to re-arrange them on your desktop is by using Mosaic. This windows manager lets you fill your Mac screen with apps windows, without having to manually move and resize them. So you can use apps side by side, without the distraction of other windows. 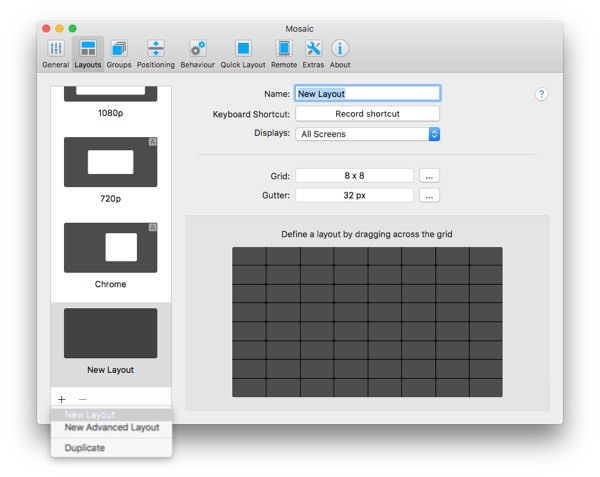 Here’s how to use Mosaic to tile open windows on your Mac screen. 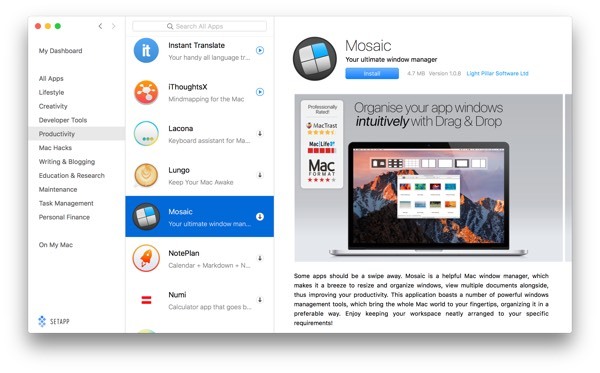 Search for Mosaic in Setapp and click Install. Once it’s installed, agree to it opening at login, or not if you don’t want it to, and give it permission to manage windows in Accessibility preferences. Click the button on the window that’s displayed on-screen to go to the Accessibility pane, then click the padlock, type in your password and click the box next to Mosaic. Choose a window that you want to tile, click and drag it. 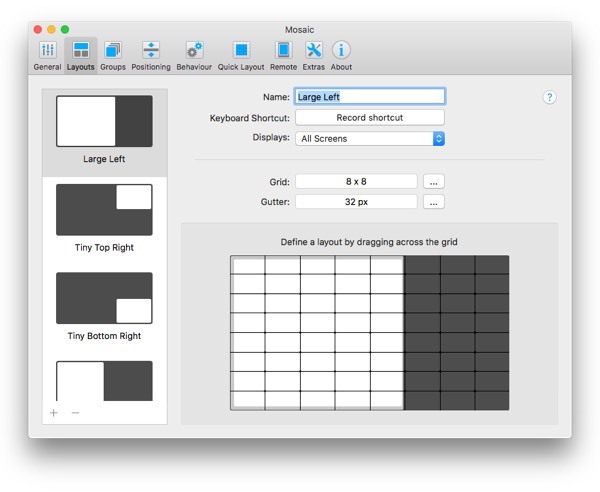 The Mosaic layout library will appear. Drag the window onto a layout and over the position you want it to take, then let go. The window will snap into position. Choose another window you want to appear on the screen alongside the one you just tiled, and drag it onto the same layout in a different position. The two windows will now appear on-screen in the layout you chose. You can click on one to make it active and work on it, just as you would normally. If you don’t like the layout view appearing every time you drag a window, you can change that behaviour so it only appears when you drag a window to the top of the screen or when you hold down the Alt key and drag a window. Click the Mosaic menu bar item, navigate to ‘Show Layouts’ and choose the option you want. Click on the Mosaic menu bar item. Navigate to the Drag & Drop section and hover over Group. 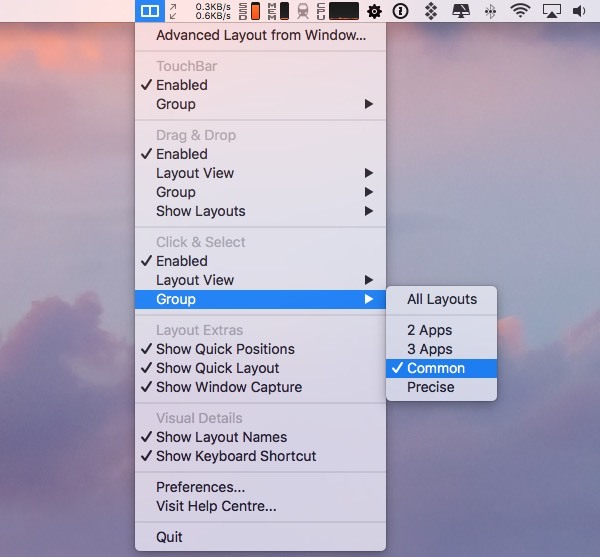 Choose the group whose layouts you want to see when you drag a window. If you want to change the way layouts appear when you activate Layout view, that’s easy too. By default, they appear in a row on the screen and if there are too many for one view, they’ll wrap onto a second row. You can change that to a column view – similar to row view but with layouts displayed vertically; a grid view – that displays layouts on a grid in the centre of the screen; or docked view – that displays half-size layouts docked to the top of the screen. To change the view, click on the Mosaic menu bar item and select Layout View, then your choice of view. To activate Layout view from a keyboard shortcut, rather than by dragging and selecting, make sure the window you want to apply the layout to is selected and press Alt-Shift-Cmd-L. You’ll see the Layout view appear on screen. Click on the layout you want to use. To change the keyboard shortcut, go to Preferences the Behaviour. Click on the keyboard shortcut at the bottom of the window and type a new shortcut. To change how layouts activated by a keyboard shortcut appear on screen, click on the Mosaic menu bar item, go to the Click & Select section and choose a Layout View. To change which layouts are displayed, do the same, but choose a Group instead. Tip: You can set up Drag & Drop differently from Click & Select so that when you activate Mosaic using one method it displays one group of layouts and when you activate using Click & Select it displays a different group. You can also set up keyboard shortcuts for positions within layouts. So, for example you could set one up for the left side of a two-window layout where the windows are side by side and each occupy half the screen. To do that, go to Preferences and click the Layouts tab. Choose the Left layout in the list of layouts in at the left of the window, then click Record shortcut. Type the shortcut you want to use. Now repeat for the Right layout, using a different shortcut. To test it, go to a window on screen, click on it and type the shortcut for Left or Right. The window will move into position. If none of the layouts in the layout library are suitable for your work, you can create a new one. Go to Preferences and click on the Layouts tab. Click the ‘+’ at the bottom of the list of layouts. Select New Layout. Give the layout a name and, if you want, record a keyboard shortcut for it. You can also specify which screen it appears on if you use multiple displays. If you want to use the default 8x8 grid and 32-pixel gutter (the space left between windows so they or their shadows don’t overlap), just draw the layout on the grid by clicking and dragging. If you want to change the number of rectangles in the grid or the size of the gutter, click on the three dots next to the option you want to change and make a selection. It's not hard to be productive with your Mac when you combine Mosaic, Workspaces, Focus and other productivity apps on Setapp. Do you have any windows management tips you wish to share?